What is the normal ratio of breastmilk to solid food for a toddler? My 21-month-old son has been slow to get into solids from the start. We make progress each month. He eats food at every meal and usually has two snacks, but often his meals are just a few bites of what we’re eating. Occasionally he’ll have a big portion of something (the size of his fist or two fists), which is thrilling but is not a daily experience. He nurses all night and probably at least eight times a day. We try to be very patient and positive, offering lots of appetizing, healthy things, and we let him feed himself if desired. I don’t think there’s much more we can do, as I think this is just the kid he is (his dad is also a pretty slight eater), but I want to know if this is normal. Erica of Child Organics: I can certainly relate to your current dilemma. I had a similar experience with my oldest daughter. It seemed like all she ever did was nurse, and she certainly didn’t seem to eat much food. Rest assured, there is a wide range of “normal” in this area. The best way for you to know what’s normal for your son is to watch your son. You can tell a lot about your child just by looking at him. Does he look healthy, seem happy, and is he growing? You may have cause for concern if you notice things like dry or brittle hair, dark circles under the eyes, bleeding gums, or a pale tongue. In most instances you can follow the lead of your child, letting his appetite be your guide. There are a few simple things you can do to try to increase his food consumption. A serving size for a toddler is about the size of their fist. By only providing whole foods as your son’s food options, you’ll be sure that he is receiving healthy, nourishing foods for his growing body. It sounds like you are already making healthy choices a priority. When he does ask to nurse, it may be a good idea to offer him something else first, such as a healthy snack. This may be a learning experience for you both. You can see how he reacts, and it also helps you analyze your nursing habits. Some mothers have found that they fell into the trap of always offering to nurse at any sign of fussiness. I have certainly been guilty of this. Nursing is often our first line of defense, which is not necessarily a bad thing. That tactic works great when they are infants, but as they grow you may try to offer some snacks first. You may also want to try to hold off nursing before meals, choosing to nurse him afterwards instead. You don’t need to feel limited to certain times for eating. Have a variety of healthy, bite-sized snacks readily available. One great idea is using a muffin tin filled with a variety of nourishing foods like avocado, apples, cheese, and eggs. Here is an excellent opportunity to get creative. 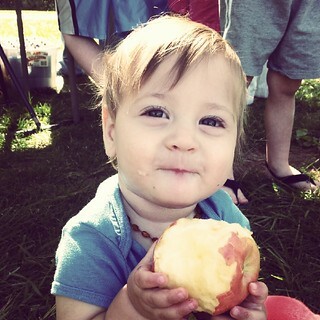 Try new fruits, veggies, and proteins for your toddler. Use yogurt, cream cheese, or guacamole as a dip. You can also use cookie cutters for making fun shapes in watermelons or sandwiches. This is an fun way to introduce them to new flavors and hopefully find some new favorites. 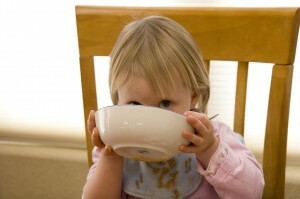 When it is mealtime or snack time, try to give your toddler your full attention. You can also involve them in the process of making food. Sit with them and make the food sing and dance if you have to. Try your best to make it an enjoyable process for both of you. In our case, we found my husband had more success at getting our daughter to eat. You may want to let your partner have a turn. One awesome reference in this area is a book called My Child Won’t Eat! : How to Enjoy Mealtimes Without Worry by Carlos González. He points out some interesting facts in regards to toddlers’ eating habits. He explains that many breastfed toddlers are resistant to eating solid food, even to the point of refusing to eat solids around one year of age. He stresses that toddlers are very busy actively learning and that it makes more sense for them to have a quick energy boost of human milk than to settle for a nutritionally inferior food. Now isn’t that smart? He explains that babies have small stomachs and prefer nutritionally dense foods (like breastmilk) over low calorie foods. Another point you may find interesting is that Dr. Gonzales says that kids eat because they are growing, and they grow at a quicker rate when they are infants. They slow in growth during the second year of life, and therefore they don’t eat as much. It can be tempting when you have a toddler who doesn’t eat much to try to keep pushing them to eat. It’s important to honor them when they say they are no longer hungry. This helps them to grow up making healthy food choices and recognizing when their body is full. You have to try to find that balance of trying to encouraging your reluctant eater and at the same time teaching them to respect their body’s ‘full’ messages. If you’re looking for more information in regards to specific toddler needs in relation to cholesterol, fats, and so on, you may want to check out the book The Family Nutrition Book: Everything You Need to Know About Feeding Your Children – From Birth through Adolescence by Dr. William Sears and Martha Sears. It’s a great resource that even includes some fun, creative recipes. Lastly, you may want to see your pediatrician or a nutritionist for reassurance. If you feel that your toddler does have some health issues or could possibly have allergies, your pediatrician may be able to offer you some assistance in that area. They could check for iron deficiency or may refer you for blood tests. Before visiting the doctor you may want to record everything your little guy eats for a week to give the doctor (and yourself) an idea of exactly what your child is consuming in a week. It sounds like you are respecting your son’s time table for weaning and honoring his path. I really think your little guy is pretty smart and knows what a good deal breastmilk is. Jennifer of Hybrid Rasta Mama: Hello mama! You are certainly not the first parent to worry about how much or how little her child is eating versus “drinking.” I, too, used to fret over whether or not my daughter was getting enough “solid” food versus breastmilk. After finding some experienced mothers in the natural parenting community, I quickly realized that my daughter was perfectly normal. First, there is no universal ratio of breastmilk to solid food intake by a child’s age. Every child’s needs will be different. If a child is larger in stature and more active, he or she will likely eat more. If a child breastfeeds only at nap and before bedtime, then he or she will also likely consume more solid food. My daughter is 3 years and 9 months old, breastfeeds 8 times in 24 hours, and probably only eats about 2 cups of solid food each day. Some days it is more and some days it is less. However, she has never fallen off of her growth curve, and she is active, healthy, and vibrant. When it comes to food intake, breastfeeding mothers often overlook the fact that breastmilk is nutrient dense and calorie rich. If you son is still breastfeeding as often as you mention, then he is probably still getting a lot of nourishment from you and simply does not need much solid food. This is fine, provided he is growing and otherwise healthy. Also remember that your child’s stomach is the size of his closed fist. This is quite small when you think about it. Adults tend to view how much our children consume in line with how much an adult is capable of consuming. Three or four bites several times per day may be completely adequate for a small child. Over the years I have learned that you can lead a child to a plate full of food but you cannot make them eat! Children are amazing at regulating their caloric needs. Unlike adults who eat out of boredom, most children really only do eat when they are hungry. The key is to have healthy, nourishing food available and accessible. Toddlers do have a penchant for being more interested in playtime than mealtime, so it is important to create a rhythm around mealtimes so your son comes to understand that there is a regularity to when food is offered. However, if he does not eat as much as you would like, try not to stress. Children pick up on our stress, which can simply make the situation worse for everyone. Remember, the three things children can control are eating, sleeping, and bathroom habits. You never want to turn any of these into a battleground (and it sounds like you are nowhere near doing that!). At the end of the day, quality of food is far more important than quantity. Offer nutrient dense foods whenever possible and, to the extent that you are comfortable, allow your son to breastfeed as often as he wants. He knows his body; trust him to lead the way. When he is ready to eat more, he likely will. When my daughter turned three, she began eating me out of house and home! Give it time. Pretty soon you will cherish those days when your son wasn’t eating everything in sight! Moorea of Mamalady: Adventures in Lesbian Parenting: Breastmilk to solids ratios in toddlers are very unique to individuals. Some tots are weaned at 21 months, some have just a little breastmilk as comfort and immune support, and some toddlers are still nursing away for calories as well. All scenarios are normal. We have all heard people say that toddlers “live on air” because many of them seem to not eat at all. I think some parents of toddlers would say that your son eating something at every meal and also having two snacks is awesome. This is a good question for your medical or naturopathic care provider, but as long as they think your son is healthy and he has normal pees, poops, and otherwise normal development, there is absolutely nothing to worry about. If you are planning on letting your son wean himself over time, you most definitely need not do more than you are already doing. Keep on offering healthy and varied food opportunities! I will add that I have found that the positive peer pressure of being around other toddlers who eat really well is an excellent way to get more foods into toddlers. 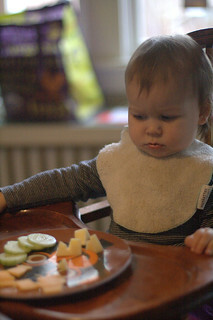 If you aren’t already familiar with the baby-led weaning approach where babies and tots are allowed to grab off of adult plates, I would recommend encouraging that. The Breastfeeding Beyond Infancy and Solids sections in our resources may be helpful too!